The Northeast Division of the Dallas Police Department is partnering with J.C. Penney and the Vickery Meadow Improvement District to offer FREE school backpacks and school supplies while supplies last. There will also be great in store promotions all day. 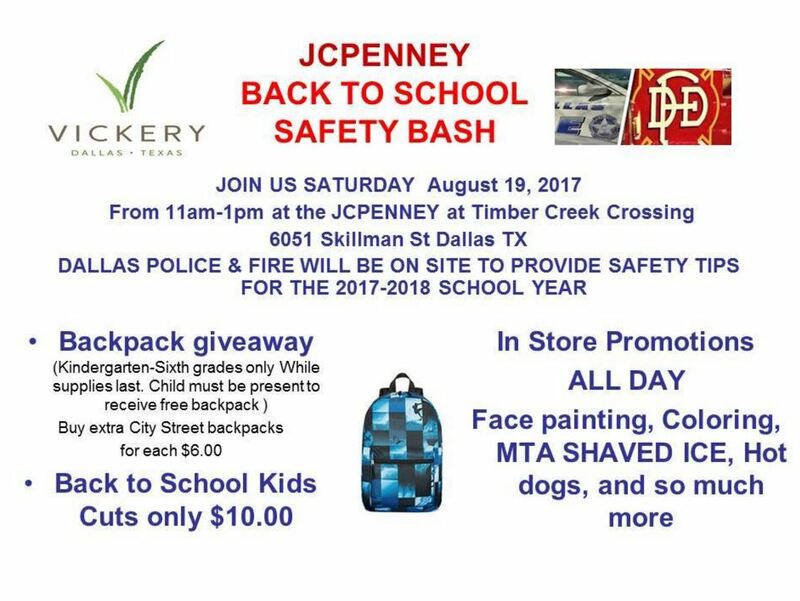 The J.C. Penney Back to School Bash will be held tomorrow, August 19, 2017 at 6051 Skillman Street from 11:00 a.m. to 1:00 p.m. Additional backpacks can be purchased for $6.00 and $10.00 haircuts will also be offered on the day of the event. Officers, volunteers, and store employees gathered today to prepare for tomorrow’s event. Vickery Meadow Improvement District has pledged $1000.00 towards backpacks and school supplies. The Northeast Division of the Dallas Police Department is attempting to purchase $200.00 in backpacks and another $200.00 in haircuts for these deserving children! If your neighborhood or organization would like to help please contact: Officer Bervin Smith at bervin.smith@dpd.ci.dallas.tx.us or cell (214) 202-6255.